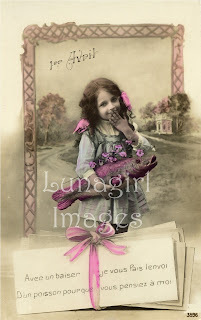 Lunagirl Moonbeams by Lunagirl Vintage Images: April Fool, April Fish? I have quite a few "Avril" postcards that feature people holding fish! Little girls, ladies, even couples with big fish. What's with the fish on these old French cards? Why is April 1st a day for fools and foolishness? Nobody seems to know for sure. There are stories about the change of calendars in the 1500s, but they don't hold up well because April Fool's celebrations existed before that time. Some people connect it to the unpredictability of weather and nature at this time of year. We do know that for many centuries, in many cultures, this time of year has been associated with celebrations of frivolity, lightheartedness, and sometimes pranks. (The Romans had a festival called Hilaria around the end of March.) Maybe it's just that the coming of spring after the long months of winter brings out our pent-up energy and silliness, and we need a day to let it out! Spring fever, I know it well. April is named for Aphrodite, the Greek goddess of love, beauty and fertility. The fish is one symbol of Aphrodite, who was born of the sea. While she is called the Love goddess, her domain is more accurately described as the sensual passion and romantic attraction that draws couples together. She doesn't care if it makes good sense or ruins your life, she just wants you to hook up! Think how sly Aphrodite uses desire and passion to "trick" creatures into love or at least lust and fertility and a lot of work and trouble! Nothing can make a fool out of you faster than love and lust. In the Greek myths Aphrodite is one capricious and "tricky" goddess. April 1 was the beginning of the New Year in some places in old Europe (right around the beginning of Spring), and that transition day from the old year to the new was frequently a time when the usual rules didn't apply and the world went topsy-turvy. Much of the tomfoolery associated with April Fool's Day could be attributed to this. Ancient customs allowed a few days when people could break the rules and get a little crazy, maybe to let off steam. Pretty wise, if you ask me.